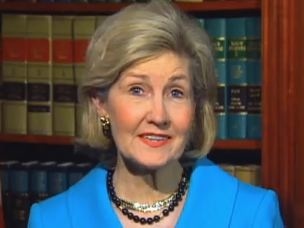 Sen. Kay Bailey Hutchison (R-TX) announced on Thursday that she will not seek re-election in 2012. In a letter addressed to her "fellow Texans," Hutchison said that her early retirement announcement would give voters in her state enough time to consider a successor in what is likely to be a crowded Republican primary fight. "Knowing that I have been able to truly help my fellow Texans and make a positive difference in their lives is a public servant's greatest reward," Hutchison wrote. Hutchison first won her seat in a special election in 1993 and is the most senior Republican woman in the Senate. In 2009, she launched a primary challenge to Texas Gov. Rick Perry and despite receiving significant early momentum and key endorsements she was defeated resoundingly in the primary. Hutchison, who positioned herself as a moderate Republican in her race against Perry, faced the prospect of having to fend off a primary challenge from the conservative wing of the GOP if she had decided to run for a fourth full term in 2012. "I intended to leave this office long before now, but I was persuaded to continue in order to avoid disadvantage to our state," Hutchison wrote. "The last two years have been particularly difficult, especially for my family, but I felt it would be wrong to leave the Senate during such a critical period. Instead of putting my seat into a special election, I felt it was my duty to use my experience to fight the massive spending that has increased our national debt; the government takeover of the our health care system; and the growth of the federal bureaucracy, which threatens our economy." Hutchison's retirement leaves with it the potential for a wide open Republican primary field in 2012. National Republican Senatorial Committee Chairman Sen. John Cornyn (R-TX), the junior senator from her state, released a statement praising Hutchison as "someone who represents the very best of the State of Texas." "Kay came to the Senate to make a difference, to work to find solutions to the complex problems of modern society, and to attain real and lasting change," Cornyn said in his statement. "She has succeeded in brilliant fashion." Jim Henson, the director of the Texas Politics Project at the University of Texas, said that three of the most viable potential Republican contenders for Hutchison's seat might be Lieutenant Gov. David Dewhurst, Attorney General Greg Abbott, and Railroad Commissioner Michael Williams. It did not take long for Dewhurst to express interest in running for the seat. "While my focus remains on the challenges we face here at the state level and making this upcoming session successful, I fully intend to explore running for the United States Senate, and should I run, I will run with the intention of winning and continuing to serve the people of Texas just as I have done throughout my career," he said in a statement that was released soon after Huchison's announcement. Both Dewhurst and Abbott are particularly high-profile conservatives who might effectively position themselves among both establishment and movement conservatives. Still, Henson said that the GOP field could turn out to be a large one. "This is the first really good statewide opening there's been in quite some time," Henson said. "There's a lot of pent up demand." On the Democratic side, former Comptroller John Sharp and former Houston Mayor Bill White, who was the Democratic nominee for governor, losing to Rick Perry in 2010-are among the potential contenders. The Democratic Senatorial Campaign Committee (DSCC) was quick to jump on the news of Hutchison's retirement and promised a tough fight for Republicans in 2012. "The 2010 cycle was full of surprises and it turns out 2012 will have some twists and turns as well: the first Senate retirement is a Republican," DSCC communications director Eric Schultz said in a statement. "We look forward to running a competitive race in Texas as the Lone Star state is now one of several Democratic pick-up opportunities next November."